As thousands of festival goers leave Worthy Farm behind, Avon and Somerset Police are reflecting on a successful Glastonbury. Overall crime rates at the festival have fallen significantly in comparison to 2008 when mobile phone crime and thefts from tents rose dramatically. In total 445 crimes (including drug offences) have been recorded by police at this time compared to 483 at the same time the previous year. 174 of those incidents were drug related in comparison to 166 last year. Theft from tents is this year down by nearly 30 per cent from 244 to 179 reported instances at the same time in 2008. Specific Challenges for the force this year included reducing the number of thefts from tents and reducing mobile phone crime as well as for the first time working in conjunction with Glastonbury Festival Security to patrol campsites. The figures for Glastonbury 2009 highlight that the policing operation has been a tremendous success. A great deal of planning goes into the Festival to make sure that it is a safe place to be for all festival goers. We always work closely with our partner agents to improve the operation year on year. Last year’s figures demonstrated that thefts from tents and mobile phone crime were the two issues that affected festival goers the most. This year the figure has been reduced significantly in both instances. Giving out crime prevention advice and using initiatives, such as the Immobilise scheme, has played a significant part in bringing these numbers down. Police in Avon and Somerset are helping residents combat crime by encouraging them to take up gardening! Gardens are often the first line of defence against crime as two-thirds of burglars gain entry to homes via the back of the property. There advice although aimed at local residents, is just as relevant wherever you live whether that be in town or county. The summer months also see an increase in thefts from gardens and sheds as people bring out their garden furniture and equipment as the weather improves. The value of property stored in gardens, sheds and garages is often much more than people realise and can soon add up. Power tools, plants, containers, hand tools, sports equipment, cycles and toys are among those items most frequently taken by garden thieves. Avon and Somerset Constabulary suggest that using defensive planting and prickly bushes to enhance the security of boundaries, around drainpipes or beneath ground floor windows, making forced entry more difficult and less attractive to would be burglars, is a simple, inexpensive and environmentally friendly crime prevention favourite. Marking power tools with postcodes and house numbers is also effective. These details can then be placed on www.immobilise.com which can be used by members of the public and businesses to register their valued possessions or company assets. Alternatively, permanently mark them by scratching or painting this will also reduce their value to the thief. People can take very simple but effective crime reduction measures, which can have a dramatic effect on their property’s overall security. Clever planting, padlocks on gates and sheds and motion sensor lights are inexpensive and effective. Garden tools are often used to assist the burglar breaking into a property – ladders, are particularly helpful to thieves for example, so keep them locked away. ‘Register your phone with Immobilise’ is the message from police to revellers headed to Glastonbury Festival next week. With the gates to Glastonbury Festival opening in just a matter of days around 177,000 people will be travelling to Pilton, many of them with mobile phones, digital cameras, iPods and cash in their pockets. And while the majority of these people will have little more to worry about than what band to watch previous year’s experience suggests that a small number may become victims of crime. While crime remains low at Glastonbury Festival, there was a rise in thefts from tents last year – particularly in the first two days of the event – and mobile phones proved to be a particular target. As a result police are this year urging Glastonbury-goers to register their mobile phones and other essential valuables on the Immobilise Database, before heading to the event, so if they are lost or stolen they can more easily be returned to their owners. The best advice for not getting your stuff stolen while you are at the festival is not to take it with you – but if you do have to take it – make sure its stored securely and wherever possible make use of the festival’s free property lock-ups available throughout the site. Police will be at the festival, both in uniform and undercover, on horseback, cycles, and on foot to deter any potential criminals but there are also lots of simple things which you can do to keep yourself as safe as possible and reduce the chances of becoming a victim of crime. 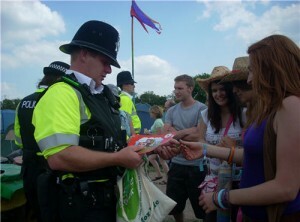 Crime at Glastonbury Festival is low and the crimes that do happen can be easily prevented. We’re urging people to plan carefully ahead of this year’s festival and leave any unnecessary valuables at home. However if they do need to take the items with them make sure they are registered on the Immobilise Database and are stored securely by making use of the free property lock-ups. I would also urge people not to leave anything valuable unattended in their tents and I’d recommend marking their property, which can both deter thieves and help to show who the rightful owner is. Bristol Police and the Safer Bristol Partnership are gearing up for National Bike Week from June 13 to 21 by organising a series of roadshows in the city to raise awareness of cycling security and to give advice on preventing bike theft. 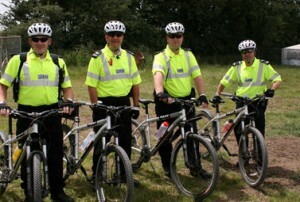 Avon and Somerset Police, in conjunction with Safer Bristol, will be at a number of locations in Bristol throughout National Bike Week (June 13 to 21) dishing out tips and advice, giving away copies of the ‘Spokes’ bike security leaflet, helping people register their bikes on the Immobilise Database and carrying out electronic tagging on bikes. Bristol is the UK’s first Cycling City, with many fantastic opportunities to get out and ride. Our aim is to ensure the roads and cycle paths are a safe and secure place to be a cyclist, be it for leisure or commuting. These events are proving really popular with cyclists helping them to keep their bikes and themselves safe. We have worked hard as a partnership to make the cycle paths in Bristol safe places to ride and we know how much people enjoy riding on them. * June 19 from 10am to 4pm at Stoke Road on Durdham Downs. To cap off National Bike Week a team of PCSOs and Police Officers will also be mounting their bikes to take part in Bristol’s Biggest Bike Ride, including PC Andy Stamp, who will be aboard a unicycle. Cambridge News Online has reported that there has been a massive increase in cycle theft since last year. The increase has prompted police to launch a new ‘Lock it or Lose it’ campaign. The force has teamed up with Cambridge City Council, Cambridgeshire County Council, Cycling City, Cambridge Cycling Campaign and the city’s CCTV operators to target cycle thieves and encourage cyclists to do more to protect their bikes. It is a free national property register that means if your bike is recovered anywhere in the country we can get it back to you. It’s free and easy to use. Starting with National Bike Week, which runs from June 13 to 21, there will be various events all over the country and Cambridge Police will be at locations around the city registering cycles and giving advice to the public. We need the public’s help to reduce bike crime. Locking your bike securely is such a simple thing to do and hugely reduces the likelihood of a bike being stolen. We want to get that message out loud and clear to all cyclists in the city. The Norwich Evening News has reported that the Norwich has seen a surge in bike crime after 50 bikes were stolen in just a few weeks. Although summer is traditionally a period which sees a rise in bike thefts, officers across Norwich have said the numbers are a sharp increase and want to warn cyclist to take more care. Increased patrols have been carried out and nine people have been arrested so far, but officers are warning other bike owners to increase their cycle security. Inspector Marie James, from the Mile Cross Safer Neighbourhood Team, said although some of the thefts are opportunist, there have been reports of people breaking into sheds and garages to steal the bikes. It is a seasonal problem and now the nicer weather is here people are using bikes more. People need to ensure their sheds are locked and secured as people have been going into sheds looking for bikes – there has been an emerging trend. Many Safer Neighbourhood Teams are offering cyclists the chance to security mark bikes, and officers advise buying a good quality lock, using a lock to secure the bike-stand, wheel rim and frame together and suggest never leaving the vehicles unattended. 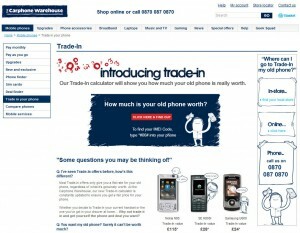 Police teams are also encouraging owners of precious or expensive items to register them on the Immobilise website.